We’ve all been there, trying to figure out the best way to get to our hotel once we arrived at the airport. While the choices may be easy at some airports such as Singapore, be warned: it’s not the case when we arrive at Ngurah Rai International Airport. If it’s your first time in Bali, then the number of options will probably make your overwhelmed. But don’t let this problem ruin your vacation. EVER! Now you’re wondering which transportation suits you well. Trust me, we have some simple options and tips for you below. Klook is one of the newcomer in the travel digital start up but has won lots of travelers heart as they give out huge discounts on destination activities and experiences. 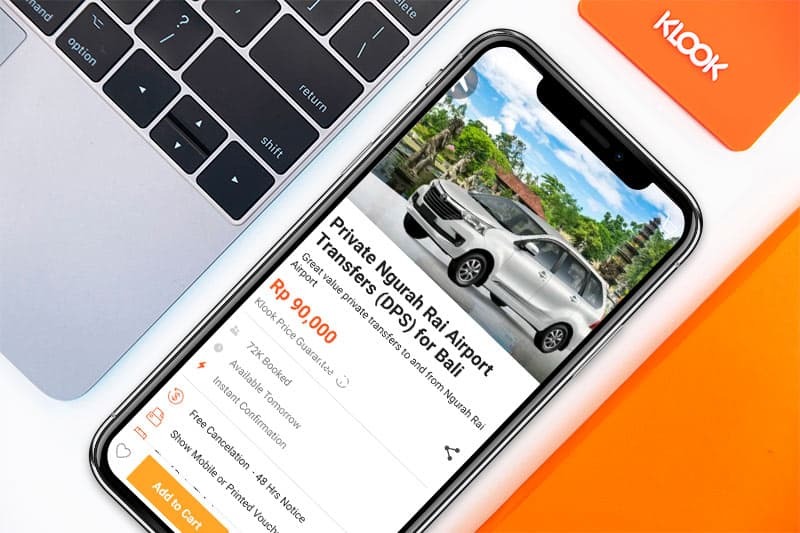 One of Klook’s service in Bali is providing Private Airport Transfer at a really affordable price. We tried booking the service and the process is really simple and can be done both from mobile phone apps or computer website. Hmm.. None that we can think of..
Kura-Kura (which means turtle in English) Transport is famous amongst Japanese tourist. Worry not, it’s well-known for its English-speaking driver and welcome guide with various language options. For whoever facing language barrier in tourist area, this is totally helpful! It’s worth it even if you have to pay extra bucks for transportation. Kura Kura Airport Transfer is the most expensive compared to the other private pick up service in this list. But with the price, it includes their Kura Kura Bus: 7 days Travel Pass. With the pass, you can explore all the tourist destinations (except Ubud) with their buses. For more info about Kura Kura Bus, you can refer to this page. Welcome guide with various language options. Very helpful indeed! Last but not least, it has clear guides and pricing on its website. It’s a common issue in Bali when you book hotel at exotic location (read: hard to find on map) or Airbnb, the local driver will sometimes get lost while dropping you at the hotel. Moreover, if you arrive late at night or early in the morning and experiencing jet lag, getting lost in the middle of nowhere is really frustrating. Solution is simple, just request your hotel to arrange a pick up service. Most of the time, the transfer service will be more expensive. But hey, at least you’ll be worry free! The price will be more expensive if you stay at luxury resorts. “Taxi mister, taxi!”, said most all of the Bali airport drivers you’ll ever met. They will swarm you with the warmest smile ever, and asking whether you need any help getting to your hotel. The drivers will offer unreasonable price at the start. My advise is to disregard them straight away and walk away. They will ask you to counter their request. 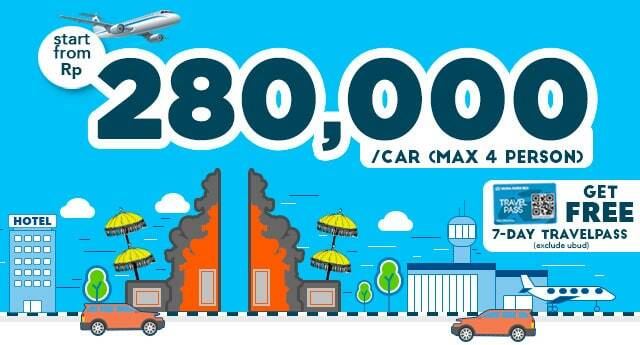 Depending on your location, you should negotiate between 200-250,000 for Kuta area. This as your last resort and only use their service if you don’t have any options left and didnot book transport in advance. Do you want to find cheap transportation to your hotel? 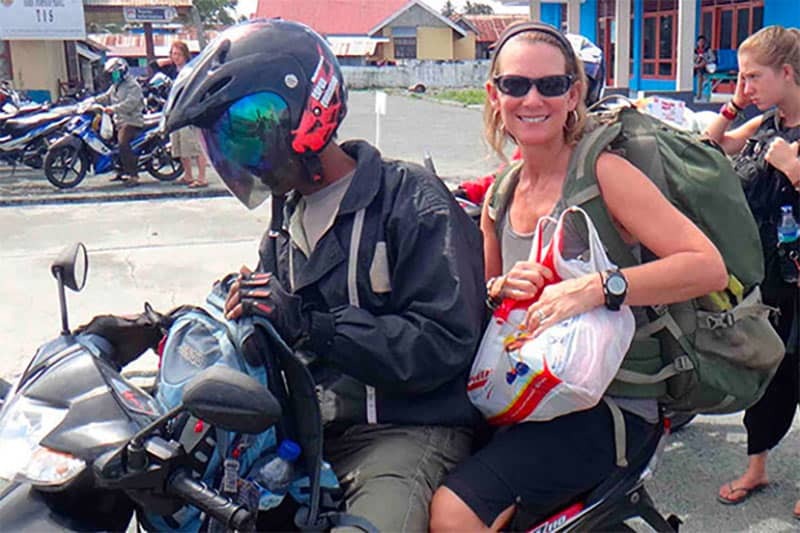 The local motorcycle driver – or known as ojek can be your lifesaver. Other than its ability to pass through traffic jam, it is suitable for finding alternative routes. Alright, so how to find these Ojek drivers in Bali Airport? You have to walk to the Domestic Terminal. Specifically near the Starbucks and Hungry Jack restaurant. There will be some Ojek Drivers on stand by. Once you agreed on a price, the driver will take you to the motorbike parking area. Let me warn you though, the driver can only carry a passenger at one time and you could only bring one backpack. If you are not traveling solo, it’s probably cheaper if you book a private car instead. Blue Bird taxi is one of the most reputable private transportation company in Indonesia. They’ve operated since decades ago and spread among big cities. Amongst all taxi brand, they are known for its fair wave meter, safety driving, and least-scam taxi. 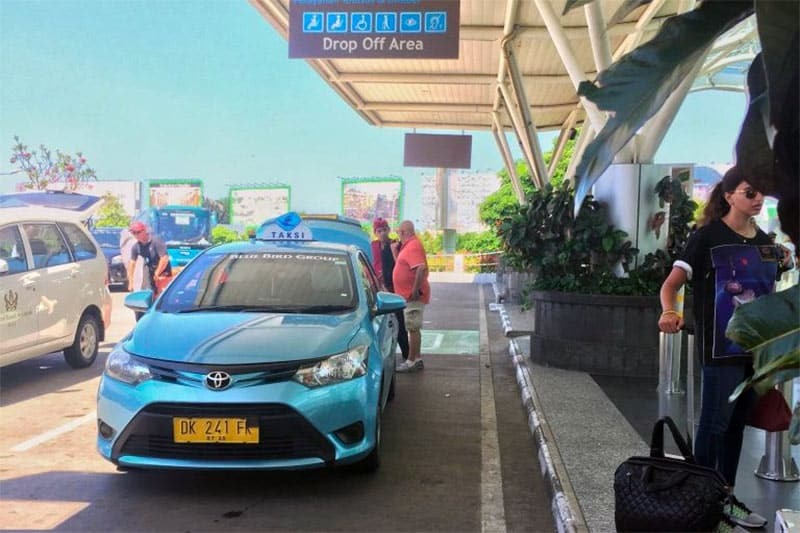 Unfortunately, Blue Bird taxi do not have licenses to operate inside the Bali Airport. However, if you still prefer to use meter taxi, you can catch some dropping off customers at the Departure Terminal. Once you reach the outside of the Arrival Terminal, take the elevator to the 3rd floor where the Departure is. Wait for any Blue Bird taxi dropping customers, quickly jump into the taxi once the customers paid. The drivers do not want to be caught pick up new customers. Alright look, for these two options, it will be less convenient to use. I really do not recommend it if you are travelling with luggages and/or with kids. You need to walk out of the Airport as these options are banned inside the Bali Airport. The gates are about 1 kilometers away from the International Departure Terminal. Whether you’re traveling in a group of alone, Grab and Go-Car are everyone’s favourite! With a few press of buttons you will get your car in front of your door step. That’s not the case in Ngurah Rai International Airport. Similar to Blue Bird taxi, the international car share startups do not have license to operate inside the Airport area. Now, if you bring light baggage and don’t mind walking a few kilometers to the nearest hotel or petrol station outside the airport, then I highly recommend you to download the apps and order the online taxi. The price is ridiculously cheap compared to the other options above. The startup also offer bigger 7-seater car for those who bring extra luggage. Its a great option to consider for your airport transfer from hotel during your departure date. 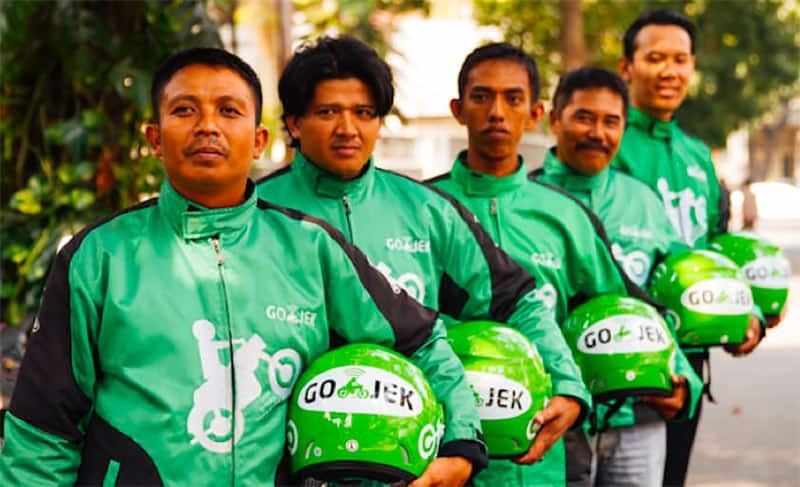 The car share startup also own the largest online motorbike service known as Grab Bike and Go-Jek. Most of the time Bali streets are relatively busy. If you don’t want to trapped in long hours of traffic jam (especially on peak time), use this service instead! This hassle-free transportation has become solo travelers’ best friend. Do you have any stories with the options above? So, do you have any stories to share using the options I mentioned above? Let us know if you have any good or bad experiences on Airport Transfer in Bali.